MMC for Health and Social Development, Dr Mpho Phalatse, Adcock Ingram Critical Care MD Colin Sheen, Executive Mayor Herman Mashaba, Netcare CEO Richard Friedland and the MMC for Environment and Infrastructure Development Nico de Jager with schoolchildren receiving brand new school shoes. The project uses non-hazardous intravenous infusion drip bags and tubing made of polyvinyl chloride that are recycled into soles for school shoes. A pioneering initiative in the healthcare industry is helping hospitals deal with their safe healthcare waste in a way that creates functional new products including school shoes, Randburg Sun reports. 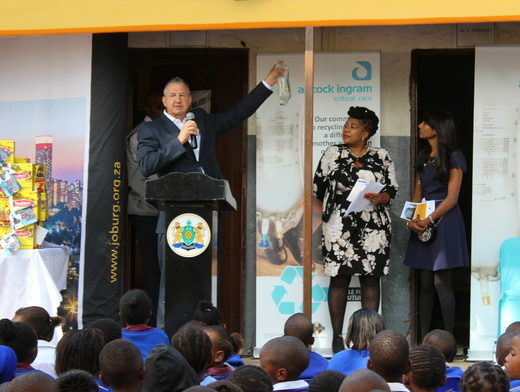 Adcock Ingram Critical Care, Netcare, Executive Mayor Herman Mashaba and the City of Johannesburg have joined forces in a recycling project in which non-hazardous intravenous infusion drip bags and tubing made of polyvinyl chloride are recycled into soles for school shoes. On 29 January, about 1 000 of these shoes were handed over to children of Masakhane-Tswelopele Primary School in Zandspruit, Gauteng. “This fantastic initiative is aligned with the A Re Sebetseng mayoral project, a clean-up campaign encouraging all citizens to take pride in their environment, community, and city,” Mashaba said. 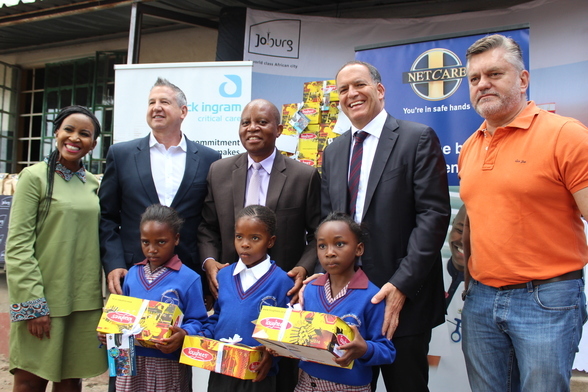 Executive Mayor Herman Mashaba with one of the recipients of 1 000 school shoes. The donation of the school shoes was of personal significance to Mashaba, who did not have shoes for school as a child. “When you have shoes, you have pride,” he said. Pride, he added, was a quality he believed was lacking in the poorest communities due to the conditions in which people are forced to live. Colin Sheen, MD of Adcock Ingram Critical Care, highlighted the groundbreaking aspect of the initiative, saying it was an example of what could be achieved when the private and public sectors worked together. Richard Friedland, CEO of Netcare said this was a worthy initiative. “By participating in this project, we are embracing a more sustainable approach to healthcare which, at the same time, is benefitting local schoolchildren,” he said. Colin Sheen, MD of Adcock Ingram Critical Care, says the project is an example of what can be achieved when the private and public sectors work together. MMC for Health and Social Development, Dr Mpho Phalatse, said Masakhane-Tswelopele was chosen as a beneficiary because it was a Quintile 1 school serving the poorest of the poor. She added the initiative was an example of the positive impact a successful hospital recycling project and strong partnership between industry and government could have on individuals and a community.